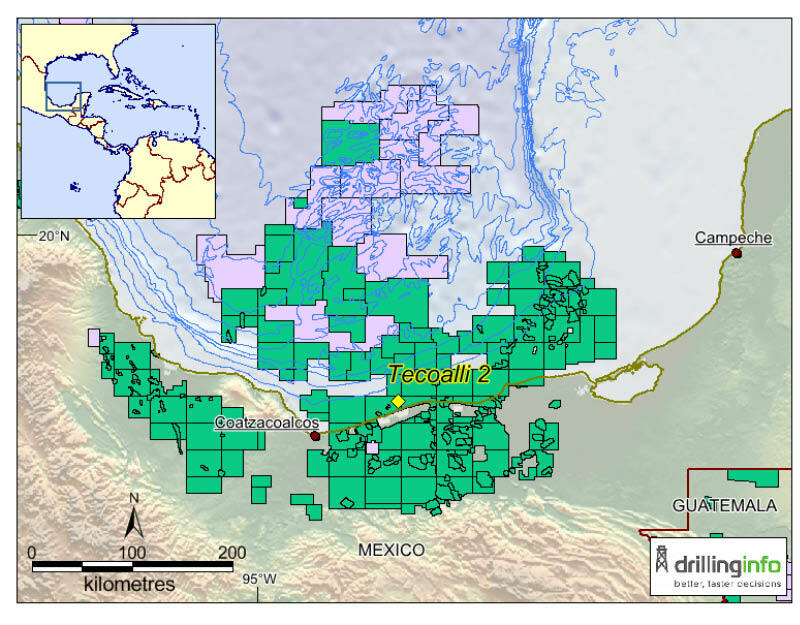 Location of Eni's Tecoalli 2 appraisal well in Bay of Campeche block Area 1. Image source: Drillinginfo. Results of appraisal well Tecoalli 2 and revised reservoir models of neighbouring Amoca and Miztón fields mean that Eni has upgraded its hydrocarbon in-place estimate for its shallow water Area 1 (CNH-R01-L02-A1/2015) PSC in the Mexican Salina del Istmo Basin from 1.4 to 2.0 Bboe, predominantly oil. In December 2017, Eni reported that it had found 40m net oil pay in Middle Pliocene Orca Formation sandstones and 27m in the Cinco Presidentes Formation. Tecoalli 2 reached a final TD of 4,420m in early December after being spudded in October 2017, having tested 7,000 bopd 30° API from the Orca Formation. Eni was recently granted a one-year extension from the CNH for this Bay of Campeche block and will submit a Plan of Development for Area 1 before making a Final Investment Decision to sanction the development. Production start-up is planned for the first half of 2019. Tecoalli sits around 24 km from the Amoca field and 13 km from Miztón. Eni has 100% working interest in Area 1. Despite recent drilling success, the Browse Basin remains relatively underexplored, and imaging and mapping of the deeper horizons presents challenges to conventional seismic. A new generation of Circum-Arctic geological and geophysical digital maps will reveal new data about the hydrocarbon potential of the region.